Acute coronary syndrome (ACS) is a syndrome (set of signs and symptoms) due to decreased blood flow in the coronary arteries such that part of the heart muscle is unable to function properly or dies. The most common symptom is chest pain, often radiating to the left shoulder or angle of the jaw, crushing, central and associated with nausea and sweating. Many people with acute coronary syndromes present with symptoms other than chest pain, particularly, women, older patients, and patients with diabetes mellitus. Acute coronary syndrome is commonly associated with three clinical manifestations: ST elevation myocardial infarction (STEMI, 30%), non ST elevation myocardial infarction (NSTEMI, 25%), or unstable angina (38%). These types are named according to the appearance of the electrocardiogram (ECG) as non-ST segment elevation myocardial infarction and ST segment elevation myocardial infarction. There can be some variation as to which forms of myocardial infarction (MI) are classified under acute coronary syndrome. ACS should be distinguished from stable angina, which develops during physical activity or stress and resolves at rest. In contrast with stable angina, unstable angina occurs suddenly, often at rest or with minimal exertion, or at lesser degrees of exertion than the individual's previous angina ("crescendo angina"). New-onset angina is also considered unstable angina, since it suggests a new problem in a coronary artery. 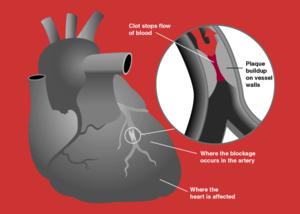 The cardinal symptom of critically decreased blood flow to the heart is chest pain, experienced as tightness around or over the chest and (often, but not always) radiating to the left arm and the left angle of the jaw. This may be associated with diaphoresis (sweating), nausea and vomiting, as well as shortness of breath. In many cases, the sensation is "atypical", with pain experienced in different ways or even being completely absent (which is more likely in female patients and those with diabetes). Some may report palpitations, anxiety or a sense of impending doom (angor animi) and a feeling of being acutely ill. The description of the chest discomfort as a pressure has little utility in aiding a diagnosis as it is not specific for ACS. Though ACS is usually associated with coronary thrombosis, it can also be associated with cocaine use. Chest pain with features characteric of cardiac origin (angina) can also be precipitated by profound anemia, brady- or tachycardia (excessively slow or rapid heart rate), low or high blood pressure, severe aortic valve stenosis (narrowing of the valve at the beginning of the aorta), pulmonary artery hypertension and a number of other conditions. In those who have ACS, atheroma rupture is most commonly found 60% when compared to atheroma erosion (30%), thus causes the formation of thrombus which block the coronary arteries. Plaque rupture is responsible for 60% in ST elevated myocardial infarction (STEMI) while plaque erosion is responsible for 30% if the STEMI and vice versa for Non ST elevated myocardial infarction (NSTEMI). In plaque rupture, the content of the plaque are lipid rich, collagen poor, with abundant inflammation which is macrophage predominant, and covered with a thin fibrous cap. Meanwhile, in plaque erosion, the plaque is rich with extracellular matrix, proteoglycan, glycoaminoglycan, but without fibrous caps, no inflammatory cells, and no large lipid core. After the coronary arteries are unblocked, there is a risk of reperfusion injury due spreading inflammatory mediators throughout the body. Investigations is still underway on the role of Cyclophilin#Cyclophilin D in reducing the reperfusion injury. Combination of troponin levels (less than 5 ng/l) with low TIMI scores can help to predict those with low possibility of myocardial infarction and discharge them safely from the emergency department. Coronary CT angiography combined with Troponin levels is also helpful to triage those who are susceptible to ACS. F-fluoride positron emission tomography is also helpful in identifying those with high risk, lipid-rich coronary plaques. If the ECG does not show typical changes, the term "non-ST segment elevation ACS" is applied. The patient may still have suffered a "non-ST elevation MI" (NSTEMI). The accepted management of unstable angina and acute coronary syndrome is therefore empirical treatment with aspirin, a second platelet inhibitor such as clopidogrel, prasugrel or ticagrelor, and heparin (usually a low-molecular weight heparin), with intravenous nitroglycerin and opioids if the pain persists. The heparin-like drug known as fondaparinux appears to be better than enoxaparin. In a cohort study comparing NSTEMI and STEMI, people with NSTEMI had a similar risk of death at one year after PCI as compared to people with STEMI (3.4% vs 4.4%). However, NSTEMI had significantly more "major cardiac events" (death, myocardial infarction, disabling stroke, or requiring revascularization) at one year (24.0% vs 16.6%). The TIMI risk score can identify high risk patients in non-ST segment elevation MI ACS and has been independently validated. Based on a global registry of 102,341 patients, the GRACE score estimates in-hospital, 6 months, 1 year, and 3 year mortality risk after a heart attack. GRACE Score 2.0 Calculator. The Killip classification consists of 4 classes based on clinical symptoms. It predicts 30-day mortality after myocardial infarction. Ischemia-Modified Albumin (IMA) – In cases of Ischemia – Albumin undergoes a conformational change and loses its ability to bind transitional metals (copper or cobalt). IMA can be used to assess the proportion of modified albumin in ischemia. Its use is limited to ruling out ischemia rather than a diagnostic test for the occurrence of ischemia. Myeloperoxidase (MPO) – The levels of circulating MPO, a leukocyte enzyme, elevate early after ACS and can be used as an early marker for the condition. Natriuretic peptide – Both B-type natriuretic peptide (BNP) and N-terminal Pro BNP can be applied to predict the risk of death and heart failure following ACS. Monocyte chemo attractive protein (MCP)-1 – has been shown in a number of studies to identify patients with a higher risk of adverse outcomes after ACS. ^ a b Amsterdam, E. A.; Wenger, N. K.; Brindis, R. G.; Casey, D. E.; Ganiats, T. G.; Holmes, D. R.; Jaffe, A. S.; Jneid, H.; Kelly, R. F.; Kontos, M. C.; Levine, G. N.; Liebson, P. R.; Mukherjee, D.; Peterson, E. D.; Sabatine, M. S.; Smalling, R. W.; Zieman, S. J. (23 September 2014). "2014 AHA/ACC Guideline for the Management of Patients With Non-ST-Elevation Acute Coronary Syndromes: A Report of the American College of Cardiology/American Heart Association Task Force on Practice Guidelines". Circulation. 130 (25): e344–e426. doi:10.1161/CIR.0000000000000134. PMID 25249585. ^ Goodacre S, Pett P, Arnold J, Chawla A, Hollingsworth J, Roe D, Crowder S, Mann C, Pitcher D, Brett C (November 2009). "Clinical diagnosis of acute coronary syndrome in patients with chest pain and a normal or non-diagnostic electrocardiogram". Emergency Medicine Journal. 26 (12): 866–870. doi:10.1136/emj.2008.064428. PMID 19934131. Archived from the original on 2017-04-05. ^ Canto JG, Shlipak MG, Rogers WJ (June 2000). "Prevalence, Clinical Characteristics, and Mortality among Patients with Acute Myocardial Infarction Presenting Without Chest Pain". JAMA. 283 (24): 3223–3229, vi. doi:10.1001/jama.283.24.3223. PMID 10866870. ^ Torres M, Moayedi S (May 2007). "Evaluation of the acutely dyspneic elderly patient". Clin. Geriatr. Med. 23 (2): 307–25, vi. doi:10.1016/j.cger.2007.01.007. PMID 17462519. ^ Grech ED, Ramsdale DR (June 2003). "Acute coronary syndrome: unstable angina and non-ST segment elevation myocardial infarction". BMJ. 326 (7401): 1259–61. doi:10.1136/bmj.326.7401.1259. PMC 1126130. PMID 12791748. ^ "Dorlands Medical Dictionary:acute coronary syndrome". Archived from the original on 2009-09-07. ^ Woo KM, Schneider JI (November 2009). "High-risk chief complaints I: chest pain--the big three". Emerg. Med. Clin. North Am. 27 (4): 685–712, x. doi:10.1016/j.emc.2009.07.007. PMID 19932401. ^ Achar SA, Kundu S, Norcross WA (2005). "Diagnosis of acute coronary syndrome". Am Fam Physician. 72 (1): 119–26. PMID 16035692. Archived from the original on 2007-10-09. ^ a b c Eisen, Alon; Giugliano, Robert P; Braunwald, Eugene (20 July 2016). "Updates on acute coronary syndrome: A review". JAMA Cardiology. 1 (16): 718–730. doi:10.1001/jamacardio.2016.2049. PMID 27438381. ^ Alpert JS, Thygesen K, Antman E, Bassand JP (2000). "Myocardial infarction redefined--a consensus document of The Joint European Society of Cardiology/American College of Cardiology Committee for the redefinition of myocardial infarction". J Am Coll Cardiol. 36 (3): 959–69. doi:10.1016/S0735-1097(00)00804-4. PMID 10987628. ^ Chun AA, McGee SR (2004). "Bedside diagnosis of coronary artery disease: a systematic review". Am. J. Med. 117 (5): 334–43. doi:10.1016/j.amjmed.2004.03.021. PMID 15336583. ^ Selker HP, Griffith JL, D'Agostino RB (1991). "A tool for judging coronary care unit admission appropriateness, valid for both real-time and retrospective use. A time-insensitive predictive instrument (TIPI) for acute cardiac ischemia: a multicenter study". Medical Care. 29 (7): 610–27. doi:10.1097/00005650-199107000-00002. PMID 2072767. ^ Goodacre, S; Pett, P; Arnold, J; Chawla, A; Hollingsworth, J; Roe, D; Crowder, S; Mann, C; Pitcher, D; Brett, C (2009). "Clinical diagnosis of acute coronary syndrome in patients with chest pain and a normal or non-diagnostic electrocardiogram". Emergency Medicine Journal. 26 (12): 866–70. doi:10.1136/emj.2008.064428. PMID 19934131. ^ Sekhri, N; Feder, GS; Junghans, C; Eldridge, S; Umaipalan, A; Madhu, R; Hemingway, H; Timmis, AD (2008). "Incremental prognostic value of the exercise electrocardiogram in the initial assessment of patients with suspected angina: cohort study". BMJ (Clinical Research Ed.). 337: a2240. doi:10.1136/bmj.a2240. PMC 2583389. PMID 19008264. ^ a b Fox KA, Dabbous OH, Goldberg RJ, Pieper KS, Eagle KA, Van de Werf F, Avezum A, Goodman SG, Flather MD, Anderson FA Jr, Granger CB (2006). "Prediction of risk of death and myocardial infarction in the six months after presentation with acute coronary syndrome: prospective multinational observational study (GRACE)". BMJ. 333 (7578): 1091. doi:10.1136/bmj.38985.646481.55. PMC 1661748. PMID 17032691. ^ Pell JP, Haw S, Cobbe S, et al. (2008). "Smoke-free Legislation and Hospitalizations for Acute Coronary Syndrome". New England Journal of Medicine. 359 (5): 482–91. doi:10.1056/NEJMsa0706740. PMID 18669427. ^ a b O'Connor RE, Brady W, Brooks SC, et al. (November 2010). "Part 10: acute coronary syndromes: 2010 American Heart Association Guidelines for Cardiopulmonary Resuscitation and Emergency Cardiovascular Care". Circulation. 122 (18 Suppl 3): S787–817. doi:10.1161/CIRCULATIONAHA.110.971028. PMID 20956226. ^ Blankenship JC, Skelding KA (2008). "Rapid Triage, Transfer, and Treatment with Percutaneous Coronary Intervention for Patients with ST-Segment Elevation Myocardial Infarction". Acute Coronary Syndromes. 9 (2): 59–65. Archived from the original on 2011-07-15. ^ Janda, SP; Tan, N (2009). "Thrombolysis versus primary percutaneous coronary intervention for ST elevation myocardial infarctions at Chilliwack General Hospital". The Canadian Journal of Cardiology. 25 (11): e382–4. doi:10.1016/S0828-282X(09)70165-5. PMC 2776568. PMID 19898701. ^ Bundhun, PK; Shaik, M; Yuan, J (8 May 2017). "Choosing between Enoxaparin and Fondaparinux for the management of patients with acute coronary syndrome: A systematic review and meta-analysis". BMC Cardiovascular Disorders. 17 (1): 116. doi:10.1186/s12872-017-0552-z. PMC 5422952. PMID 28482804. ^ Montalescot G, Cayla G, Collet JP, Elhadad S, Beygui F, Le Breton H, et al. (2009). "Immediate vs delayed intervention for acute coronary syndromes: a randomized clinical trial". JAMA. 302 (9): 947–54. doi:10.1001/jama.2009.1267. PMID 19724041. ^ Vale, N; Nordmann, AJ; Schwartz, GG; de Lemos, J; Colivicchi, F; den Hartog, F; Ostadal, P; Macin, SM; Liem, AH; Mills, EJ; Bhatnagar, N; Bucher, HC; Briel, M (Sep 1, 2014). "Statins for acute coronary syndrome". The Cochrane Database of Systematic Reviews. 9 (9): CD006870. doi:10.1002/14651858.CD006870.pub3. PMID 25178118. ^ Cox, D. A.; Stone, G. W.; Grines, C. L.; Stuckey, T.; Zimetbaum, P. J.; Tcheng, J. E.; Turco, M.; Garcia, E.; Guagliumi, G.; Iwaoka, R. S.; Mehran, R.; O'Neill, W. W.; Lansky, A. J.; Griffin, J. J.; Cadillac, I. (2006). "Comparative Early and Late Outcomes After Primary Percutaneous Coronary Intervention in ST-Segment Elevation and Non–ST-Segment Elevation Acute Myocardial Infarction (from the CADILLAC Trial)". The American Journal of Cardiology. 98 (3): 331–337. doi:10.1016/j.amjcard.2006.01.102. PMID 16860018. ^ McCord J, Jneid H, Hollander JE, et al. (April 2008). "Management of cocaine-associated chest pain and myocardial infarction: a scientific statement from the American Heart Association Acute Cardiac Care Committee of the Council on Clinical Cardiology". Circulation. 117 (14): 1897–907. doi:10.1161/CIRCULATIONAHA.107.188950. PMID 18347214. ^ Antman EM, Cohen M, Bernink PJ, et al. (2000). "The TIMI risk score for unstable angina/non-ST elevation MI: A method for prognostication and therapeutic decision making". JAMA. 284 (7): 835–42. doi:10.1001/jama.284.7.835. PMID 10938172. ^ Pollack CV, Sites FD, Shofer FS, Sease KL, Hollander JE (2006). "Application of the TIMI risk score for unstable angina and non-ST elevation acute coronary syndrome to an unselected emergency department chest pain population". Academic Emergency Medicine. 13 (1): 13–8. doi:10.1197/j.aem.2005.06.031. PMID 16365321. ^ Chase M, Robey JL, Zogby KE, Sease KL, Shofer FS, Hollander JE (2006). "Prospective validation of the Thrombolysis in Myocardial Infarction Risk Score in the emergency department chest pain population". Annals of Emergency Medicine. 48 (3): 252–9. doi:10.1016/j.annemergmed.2006.01.032. PMID 16934646. ^ Killip, Thomas; Kimball, John T. (1967). "Treatment of myocardial infarction in a coronary care unit". The American Journal of Cardiology. 20 (4): 457–464. doi:10.1016/0002-9149(67)90023-9. ^ Khoshchehreh M, Groves EM, Tehrani D, Amin A, Patel PM, Malik S (2016). "Changes in mortality on weekend versus weekday admissions for Acute Coronary Syndrome in the United States over the past decade". Int J Cardiol. 210: 164–172. doi:10.1016/j.ijcard.2016.02.087. PMC 4801736. PMID 26950171. ^ Kostis W.J. ; Demissie K.; Marcella S.W. ; Shao Y.-H.; Wilson A.C.; Moreyra A.E. (2007). "Weekend versus weekday admission and mortality from myocardial infarction". N Engl J Med. 356 (11): 1099–1109. doi:10.1056/nejmoa063355. PMID 17360988.